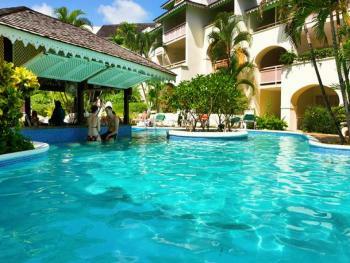 The Turtle Beach Resort in Barbados spacious and scenic with palm trees, white sand, and turquoise blue water. Plenty of amenities populate the property. The all-inclusive, upscale Turtle Beach by Elegant Hotels has a great location on Dover Beach and the St. Lawrence Gap, and is close to entertainment and attractions. The contemporary rooms are a bit basic for this caliber, but all have balconies or patios. The beach is spacious and scenic with palm trees, white sand, and turquoise blue water. Plenty of amenities populate the property, including three on-site restaurants, a spa, fitness center, two pools, a kids' club, and an on-site water sports provider. However, prices are high, especially for the American market. Waves Barbados is a cheaper upscale all-inclusive, but it's located on a different part of the island.